If you could write a New Year’s resolution for someone else, what would it be (and for whom)? True or False: You should live each day as if it is your last. True or False: I am good at forgiving. True or False: Everything happens for a reason. The consensus around the table was solid: yes, the past is over. Done, finished. It has effects on the present, but it is not in the present. I had to disagree, as I’m with Faulkner on this one. “The past is never dead. It’s not even past,” he wrote. In this spirit, I share with you a journal entry from my former high school history teacher, Jack Barnwell. To borrow from John Denver, “I’ve been lately thinking about my life’s time, all the things/ I’ve done and how it’s been.” More particularly, my mind has flashed back to the early 1970’s. John Denver, James Taylor, and Carly Simon were the balladeers who I thought, and still think, defined their generation, which is mine: a generation that grew tired of protests (which to impatient youth seemed futile); disgusted with Nixonian politics and disillusioned by politicians (Sam Ervin, perhaps, excepted); and inclined to seek gratification in personal, usually romantic, relationships after disappointing forays into the problems of the wider world. My frame of mind coincided with the publication of Carly Simon’s memoir, Boys in the Trees. She writes well, with an amazing recall of detail. The book is at its best in her recollection of her childhood and adolescence intertwined with the tragic downfall of her father Richard Simon, the co-founder of Simon and Schuster publishing. When she turns to her adult years as an up-and-coming musician the book’s structure seems to lapse into a catalogue of her lovers, casual and otherwise, until she marries James Taylor. She chronicles that relationship with care from the days of absorption in the newly acquired spouse, to the joys and worries of new parenthood, to the loss of trust and the rage of discovered infidelities. Her meditation on the meaning of love for her husband, even as they trudged and slogged through the quagmire of separation, and her feelings for him thereafter as the father of her two children may be a little too touchy-feely for some, but it seems quite honest. Curiously, her second marriage, which lasted twenty years, as opposed to eleven for her first, receives not a word. I suppose that is one reason the book is properly in the genre of a memoir, rather than autobiography. And, it may be that Ken Burns, the producer of popular television documentaries and the publisher of Flatiron Books, maybe even her editor, advised her to concentrate and end the memoir on the James Taylor relationship as the one to arouse the most interest (and the most sales). The days of a Max Perkins as editor are long gone. Editors at the commercial publishers now do marketing, not critical advice, much less copyediting. The push is for revenue – screw the critics – not literature and revenue. 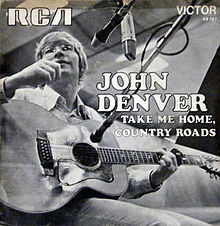 My memories of John Denver revolve around taking Beth to a concert he gave in Carmichael Auditorium when she was a first-year and I was a second-year graduate student at Carolina. His “Take Me Home, Country Roads” enchanted us both, and I quickly bought her his “Poems, Prayers, and Promises” album, released a few months before we went to that concert. [Of] becoming what I never thought I’d be. Denver did not write the lyrics, and by 1981 when it was released his voice had not improved. It was probably not as clear or as resonant as it had been a decade earlier. But he seems to have imbued the song with an emotional authenticity lacking in, say, “Take Me Home Country Roads.” Certainly, he was no longer writing paeans to flawless, everlasting love. By the following year Annie Martell, the inspiration for “Annie’s Song,” which reached number 1 on the charts in July 1974, would be his ex-wife, and the property settlement in their divorce produced such a surge of bitterness that he took a chainsaw to their once shared bed in their house in Aspen. So much for a flashback to the seventies. Time to turn to the present. As of yesterday, Beth and I have been married for thirty-nine years. I asked her whether it would be a good idea to have our traditional New Year’s Day meal tonight (a day early) so that our daughter Leigh could eat it with us. My little girl is now thirty-one and is smarter – and I hope will be a better lawyer – than was I in my rapidly receding prime. She flies back to New York tomorrow. Beth gently vetoed that notion as counter to good luck and proposed instead broiled salmon with tarragon-butter sauce, squash and potato casserole, fruit, and biscuits. She is working on that now. After supper I will binge on football games, especially the Alabama/ Michigan State matchup. Perhaps Beth and Leigh will join me, at least for a little while. A New Year’s Day dinner with such long-standing affection sounds like a lovely way to start the year. Thank you for sharing this, Jennifer! I’m always bowled over by my cousin Jack’s writing ability and maybe even more so by his attempt at leading an “intentional” life as I blithely sail on by, just being….this brought back lots of memories – I always identified with Carly Simon ………very nice, cousin I also love the dinner table questions from Jennifer – I would be a Grand Marnier and I don’t think the past is over – it’s what we are today.